Being that this really is such an epic temple, Borobudur offers excellent transport connections for the many thousands of sightseers who travel here each year. Buses and taxis are particularly popular modes of transportation for reaching Borobudur Temple, and for those who are staying close by, it is even possible to rent a becak (bicycle rickshaw). Once you have arrived at Borobudur Temple, there is no public transport and so the best way to travel around the area in on foot, although a toy train is on hand to connect the temple and museums, if your legs are feeling weary. Nearby, the Prambanan temples are just a short excursion away by road. 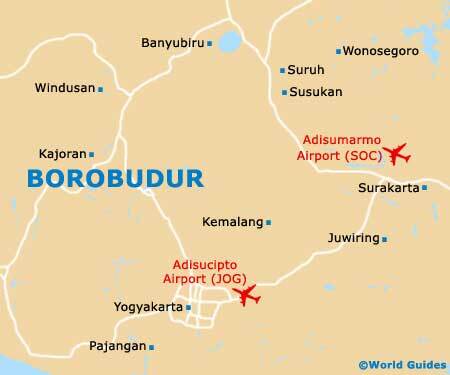 The closest airports to the Borobudur Temple are to be found at the cities of Solo (Surakarta) and Yogyakarta. Location: 97 km / 60 miles to the east (journey time of around two hours). Location: 50 km / 31 miles to the south-east (journey time of just over one hour). Many people holidaying on Java choose to hire a car when they first arrive on the island, with both local and international car rental agencies being in plentiful supply at the nearby Adisumarmo Airport in Solo, and at the Adisucipto Airport in Yogyakarta. Those wishing to drive between the Borobudur Temple and Yogyakarta will be pleased to find modern multi-lane highways in place, making this journey easy and fast. Tourists preferring to travel around the Borobudur area of Central Java by using public transport will find that many surrounding places of interest are well connected by buses. The Umbulharjo bus terminal in Yogyakarta is just 42 km / 26 miles away and travels to Borobudur via Muntilan, making a number of further stops along the way and generally using the Yogyakarta to Semarang road. From Borobudur's bus terminal, buses also travel to nearby Magelang. Local minibuses (bemos) are also on hand and connect the neighbouring temples at Mendut and Pawon. If you are based outside of Borobudur and are looking to get here by the most convenient means, then taxi transport is worth considering. Even from as far away as Yogyakarta, taxis to the Borobudur Temple are really quite affordable, especially when you are able to share the cost with other passengers. Most hotels will be happy to arrange a taxi on your behalf, if necessary.